I love to cook turkey in a bag - no clean up. 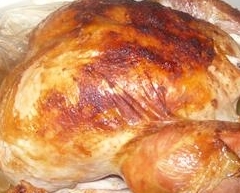 The cooking bag creates a moist heat cooking environment for the turkey and produces a turkey that is juicy and tender. Be aware, however that the skin of a turkey cooked in a roasting bag will not be as crisp. You may place the bird under the broiler for a few minutes to brown up. The seasonings are suggestions, just use your favorites if you wish. PREHEAT oven to 350 degrees. Spray the inside of the bag so the skin doesn't stick to it. Grease a 9x13 inch oven dish. Clean the turkey pieces well and rub with butter. Sprinkle both sides of the turkey with the seasonings. Carefully place the turkey pieces into the bag and arrange the celery and onion around the meat. Place inside the sprayed cooking bag and close bag with a nylon tie - place in a 9x13 pan. Make six 1/2" slits on the top of the bag. Bake until thermometer reads 180 degrees. If it is stuffed, it will take 30 minutes longer. Serve with mashed potatoes and salad. It's a great meal.